Free Hormel Compleats (7.5-10 oz., select varieties) in Kroger stores, with coupon. This Kroger Free Friday Coupon is available for download on Friday, September 21, 2018 but you have until October 7, 2018 to redeem it. What is Hormel Compleats? Hormel Compleats is an easy to prepare meal, all you have to do is to place unopened plastic tray in boiling water and simmer for about 9 minutes. And here you go! Ready to be eaten. 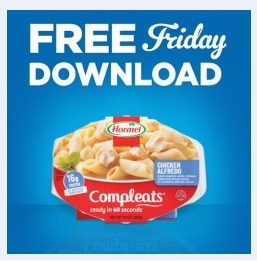 Redeem your coupon in-store within 2 weeks for free Hormel Compleats (7.5-10 oz., select varieties). Your coupon will automatically be applied at checkout when you use your Shopper’s Card. Available in most stores.